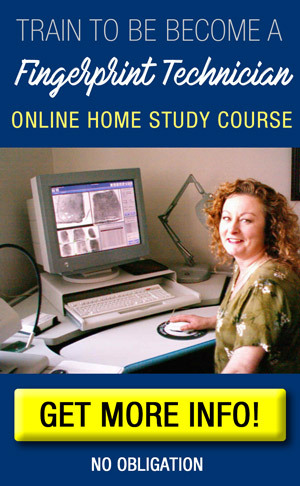 The tools that a fingerprint technician uses are extremely important in performing the job. They must be clean, accurate and calibrated correctly so the fingerprint technician can make a fingerprint comparison correctly. They also must know how to use the tools correctly, failure to do so can result in a bad fingerprint identification and ultimately identifying two fingerprints as the same when they are not. Here is a list of the most common tools a fingerprint technician uses. If you familiarize yourself with these now, you have a better chance of getting hired as a fingerprint technician in the future. Taking inked fingerprints is one of the main job duties of a fingerprint technician, this is done at a fingerprint ink station. 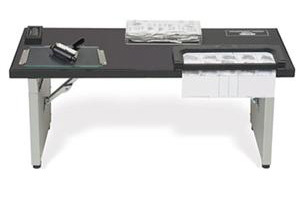 They are a special type of table with the necessary tools to take inked fingerprints, including a fingerprint card holder, a place for the ink slab, ink roller and sometimes a storage area to keep extra tools. Fingerprint technicians cannot use regular ink you buy at an office supply store, they must use a special type of ink that is specially designed for inking fingerprints. It is thicker, more viscous and a very dark black color. A fingerprint ink slab is used to spread a small amount of ink on and create a nice big surface for people to place their fingers. They are usually made from glass or plexiglass and are a very smooth surface. A fingerprint ink roller is used to spread the ink on the ink slab. 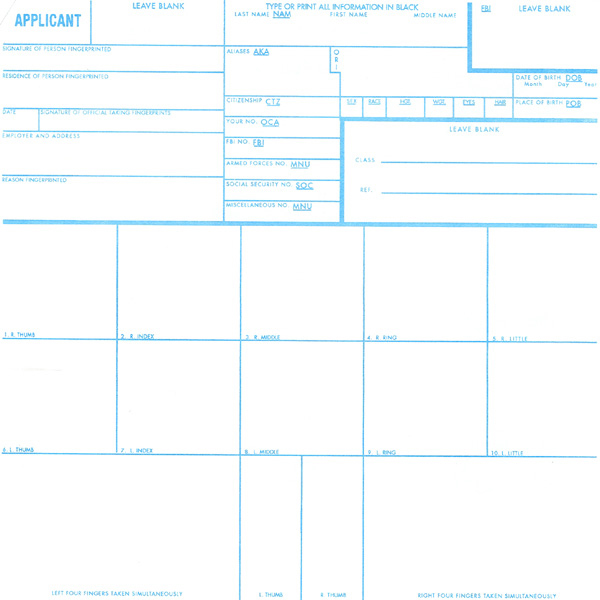 A common size is 4″ slab which allows enough room for the person to place all four fingers on the slab. The ink remains on the slab, it is not cleaned after each use. Many agencies use the fingerprinting stations on a constant basis, to clean it constantly would take too much time. Sometimes the ink can be refreshed after rolling the ink to mix it up a bit. Since the ink is very thick, it rarely dries out or hardens. There are three types of fingerprint ink cards. Criminal Justice fingerprint cards are for people who are being fingerprinted for criminal reasons, either they are being arrested or their fingerprints are required to be on file for some reason. These cards are red. 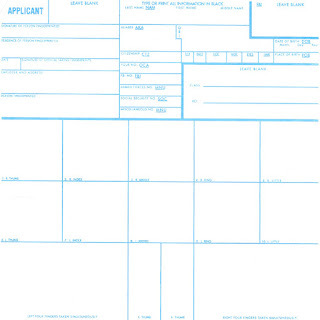 Applicant fingerprint cards are blue and are used for people who are applying for a law enforcement job, teaching job or any job that requires a fingerprint background check. 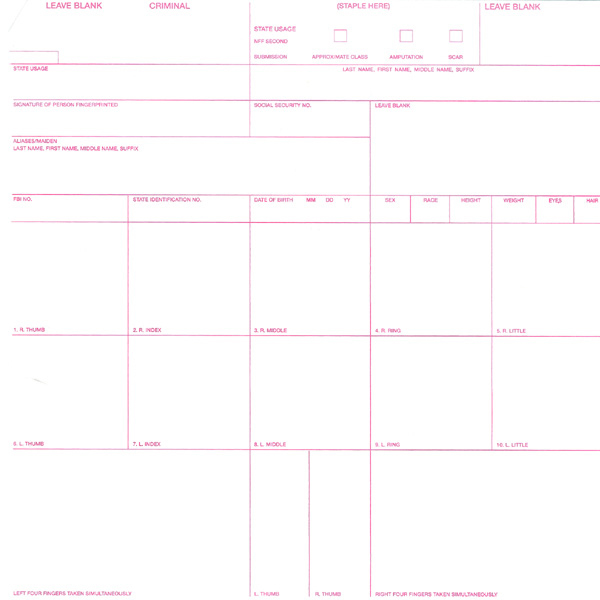 Major case print cards are black and used for taking palm prints. The front of the card has the standard areas for each finger, then on the back is a big area for the palm print. When fingerprint technicians read fingerprints from a fingerprint card, they use a magnifying glass to enlarge the print so it can be read better. A fingerprint magnifying glass also has a small piece of glass in the bottom with red markings so the fingerprint technician can place the marking on an identifying part of the fingerprint and count the number of ridges, if this is needed. Not all fingerprints are taken with ink, recently a new advancement has come around that allows fingerprints to be taken without ink. 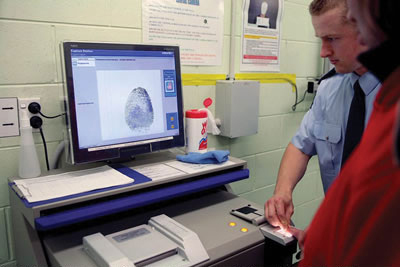 The LiveScan machine uses a glass platen to read the fingerprints and display them on the screen and later saved into a fingerprint record. The fingertips are sprayed with distilled water and placed on the glass platen, this allows greater readability by the scanner. 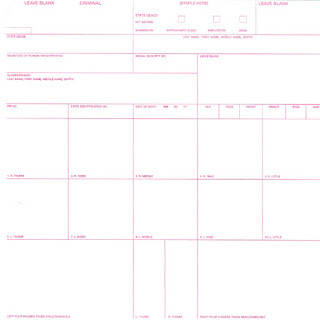 The fingerprints are collected in the same order and manner as inked fingerprints. Most criminal justice agencies use AFIS, which stands for Automated Fingerprint Identification System, to help speed along fingerprint comparisons. 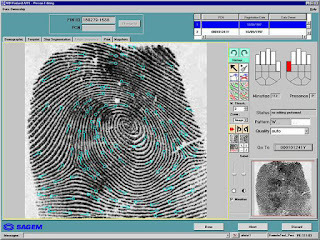 This is a computerized system of making fingerprint comparisons based on the fingerprint ridges and ending points. The computer can do this much, much faster than the old manual system. Most AFIS systems will bring up the top five candidates for a possible fingerprint match. Then the fingerprint technician will go through the five results and determine if each one is a match or not a match. If a match is found, then the two fingerprint records are merged and become one record. If no match is found, a new fingerprint record is formed with the unmatched fingerprints.